An enchanting view in Provence in the heart of an exceptional setting. The lodging "Mathis des Amandiers" between Drôme and Ardèche, mixes with happiness the heat of the noble and ecological materials and the charm of the old furniture. The cottage is "all inclusive" (service +: cleaning, sheets, towels and several other attentions). All you have to do is leave your luggage and enjoy your stay. Composed of a spacious and complete open kitchen, a fireplace, a spacious terrace (dining area, summer lounge, deckchair, barbecue), a spacious living room with sofa bed 150X200 (in addition to the 2 bedrooms) , flat screen and DVD, a beautiful bathroom and sink, a first room with 2 beds 100X190 with spacious balcony, a room with bedding "king size" upscale 180X200 (good nights insured) with its bathroom (walk-in shower), large closet and breathtaking 240 ° view of the plain Marsanne. Neat decoration and layout to serve your comfort and relaxation. The house, built on 6 centuries old walls, is restored in the rules of the art with the comfort of ecological materials, will certainly be a cozy nest. The region will flood you with its generous sun, its intoxicating scents of lavender, thyme and laurels, its contrasting landscapes. In a few kilometers you will pass fields of olive trees and lavender reliefs, gorges and hills punctuated villages perched. After these cultural, sporting and relaxing discoveries, after having taken the time to let yourself be carried away by Provencal roads and paths, it will be time to let yourself be seduced by THE PROVENCAL CUISINE AND GASTRONOMY full of colors and subtle flavors. The addresses of small country bistros, restaurants and inns are innumerable. Each trip will be an opportunity to see, hear, smell, but also to taste the specialties of the region. In entry, melon of Cavaillon and ravioles of Romans. As a dish, lamb of Adrets confit or abomasum accompanied by a minced zucchini or a 'Bohemian' (peppers, aubergines, tomato, garlic in shirt, olive oil and herbs). Some great wines (VACQUEYRAS, BEAUME-DE-VENISE, GIGONDAS or CHÂTEAUNEUF-DU-PAPE) will accompany the whole. Before dessert, some fresh picodons or made of Dieulefit or Crest. For dessert, Pogne de Romans with chestnut cream from Ardèche accompanied by Carpentras strawberries sweetened with lavender honey or chestnut. To finish in style, a small infusion with lime and freshly cut Tym accompanied by Valrhona chocolate or nougats of Montélimar. In short, the description of the territory will be a real inventory in the Prévert. Now to understand we have to come join us. An enchanting view in Provence in the heart of an exceptional setting. Très beau gîte. Équipement de qualité. Charmant petit jardin avec beaucoup d’ombre quand il fait trop chaud. Grâce aux murs épais il fait toujours agréablement frais dans la maison. Le gîte est bien situé pour rayonner et visiter les très jolis villages perchés dans les environs. La propriétaire est de très bon conseil. Hôtes charmants et très respectueux des lieux. Cela a été un plaisir sincère de les accueillir et les guider. Une belle rencontre et agréable moment. Dommage que le séjour fut court il m’a manqué de faire découvrir à ces hôtes ma passion pour la cuisine autour d’un bon petit plat ! Mes amitiés à nos amis Belges toujours aussi chaleureux et gentils. Wir haben 3 angenehme Wochen im Gite Mathis verbracht. Das Haus ist liebevoll eingerichtet, die Zimmer geräumig. Es fehlt an nichts. Die alten Mauern sorgen für eine angenehme Kühle an heissen Sommertagen. Im schattigen Innenhof liess es sich auch bei Wind und hohen Temperaturen gut aushalten. Das Haus liegt sehr günstig in einer landschaftlich sehr abwechslungsreich Umgebung, das Rhonetal, die Voralpen und die Felsmassive der Alpen, aber auch die Sehenswürdigkeiten der Provence sind nicht allzu weit entfernt. Die Besitzerin Geraldine hat uns viele gute Tipps für Ausflüge gegeben.
" Nous avons passé tous les 4 un très agréable séjour au gîte Mathis du 19 au 26 août l'été 2017. Le gîte est idéalement situé pour rayonner sur la Drôme Provençale et nous avons profité des marchés, baignades, ballades pleine nature, route des vins, festivités. Les enfants ont eux adoré les piscines familiales dans les villages allentours, la caverne du Pont d'Arc, la ferme aux crocodiles, et les nombreuses activités sportives que nous avons pu essayer en famille à proximité comme le canoë, le golf, une randonnée à cheval, l'escalade dans le superbe site de la forêt de Saou. La propriétaire Géraldine nous a réservé un adorable accueil et a pris le temps de nous guider sur la carte en nous proposant même un parcours pour la semaine et nous recommandant de nombreuses adresses dont en particulier de sympathiques restaurants. 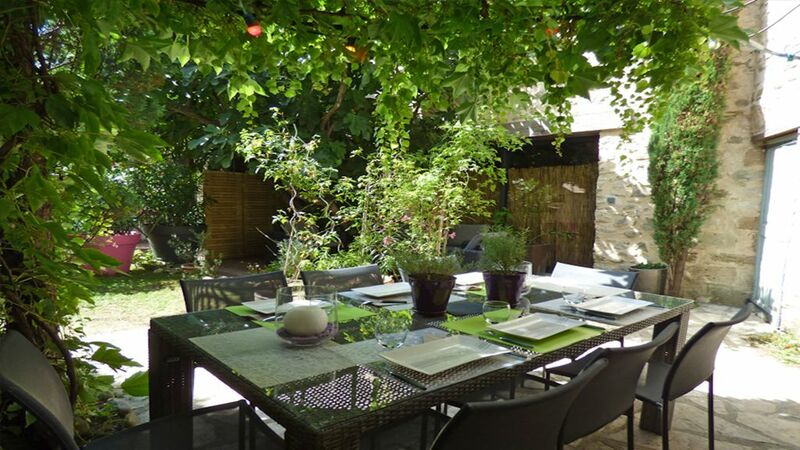 Le gîte est soigné, décoré avec goût et en cette saison chaude nous y avons apprécié la fraîcheur des pièces de vie salon / cuisine et profitions du mignon jardin et terrasse pour prendre matins et soirs les repas. Une belle adresse !" Exit A 7 Montélimar Nord. Direction Montélimar, then Sauzet, then Cleon of Andran. you have 2 km, direction CHAROLS, at 40, rue du Pâtis, 26450 CHAROLS. Exit A 7 Montélimar South. Direction Montélimar, then Dieulefit, then La Bégude-de-Mazenc. you have 5 km, direction CHAROLS, at 40, rue du Pâtis, 26450 CHAROLS. Here you have arrived. Place to relax. Ideally located between Sea and Middle Mountain, In DRÔME PROVENCAL and close to L'ARDECHE, you are at the crossroads of GRIGNAN, its castle of Mme de Sévigné where you play the most beautiful pieces and its fields of lavender and olive trees at a loss DIEULEFIT (its famous pottery and picodon), SOU (its forest, its geology and its walks), CREST (medieval city, its jazz festival and its markets), MONTELIMAR city of nougat, are all within 20 kms . Several villages classified "most beautiful villages of France" (Mirmande, La Laupie, Poet-Laval) within 15 kms and castle Grignan, Suze-La-Rousse, The Adhemar. The Provençal good life of NYONS at half an hour. Near the ROUTE DES VINS, about forty kms away, you will taste the greatest wines: VACQUEYRAS, BEAUME-DE-VENISE, GIGONDAS and CHÂTEAUNEUF-DU-PAPE. LUBERON in Provence and its famous villages (Gordes, Rousillon, Lourmarin, Cabrières, Bonnieux ...) are at 1:15. AVIGNON, its Bridge, its Palace of the Popes and its Festival less than an hour. The Cave of the Arc Bridge classified as World Heritage by UNESCO. Prix semaine ou WE particuliers lors des fêtes de Noël et Jour de l'an Une caution de 800 euros sera demandée à l'arrivée (mais non débitée) en chèque ou espèce. Supplément animal de compagnie de 60 euros.